how come i only see only chinese-look people are waiting there? i thought they are known as second class citizen? where are the first class people then? First class citizens dont queue. Getting it later also no problem. They are not the kind to showoff! That is why they are First Class! A people who does not know how to be grateful. Ugly outsider uglier inside! using iphone doesn't make you first class person. 1st class citizen no need to queue. UMNO delivers to their house directly by DHL. Go open house and complain about food? Have you been to company AGMs? They bring along the family, eat like gluttons and then ask the maid to takeout their tupperware and tapau the food! So greedy. Dont care if others have nothing to eat. It even happens at open houses. They have no shame. Hey, even the poor and homeless at the food kitchens have manners. Thanks a million for mentioning our silly website! 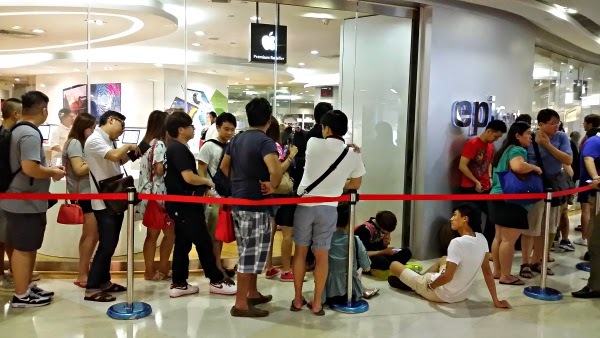 For those interested, the photo was lifted from a photo of Singaporeans queuing at EON for the iPhone6 a month or so ago. Even we fake journalists make the odd blunder but we are pleased as punch this post is so popular! We shop at Midvalley, they shop at Harrods. We drive Perodua, they drive Bentley. OK lah, we recognise the first class people, the billionaires created by DUMNO. Are they for real, Latuk ?